• Monitor and analyze passengers usage of the trolleys thanks to passenger counters installed around the trolleys' doors. • Keep a close eye on their trolleys maintenance tasks to make sure they are always running properly and never breaking down. • Monitor the trolleys' routes and improve their efficiency to create better routes by analyzing estimated times of arrival, driver behaviors, and more. • Receive alerts of important activity such as if the trolleys are taking too long at a stop, if they break down, if there is a security breach, if there is tampering with the tracking devices, if drivers are exceeding speed limits, and much more. • A public tracking website for passengers to track the trolleys' location in real-time, routes, estimated times of arrivals, and more. • Access to the TSO Mobile's Trolley Tracker mobile app. • Passengers will have LED announcers in the trolleys. 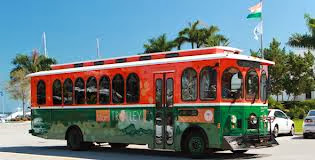 • The benefits are trully unlimited, being the most important one the fact of passengers being able to know estimated times of when they should head out from their homes to the trolley stop (no more waiting outside for late trolleys for long periods of times). Also, passenger can access trolley location information and estimated arrival times through TSO Mobile's AVIS (Automated Vehicle Information System) which provides all this information by just calling a phone number. CLICK HERE to get a full demo of our public transportation solutions. TSO Mobile is proud to be City of Hollywood's solution to take their public transportation system to the next level and make the passengers' experience a more pleasant one!